Call A to Z Entertainment, Inc. today for free information about how to hire or book country music singer Keith Anderson. With over twenty years of successful experience, we are your best agency for booking and hiring country musician Keith Anderson! We book and help you hire any live professional entertainment you want, including live country music singers, country musicians, and live country music bands. We also help you plan and produce your event. So call us today at 888-655-4575 and we will be happy to help you. Singer and songwriter Keith Anderson’s latest song “I’ll Bring The Music” sums up Anderson to a T. That is one thing that you can always say about this academic athlete from Miami, OK, who has always excelled at anything he has put his mind to, is he WILL bring the Music. Although he has co-written hits for other artists, most notably “Lost In This Moment”, the No. 1 smash for Big & Rich which garnered him a CMA and ACM Song of the Year nomination, Anderson does not write with other artists in mind. “I think I’ll always write about what I know and feel and typically with myself in mind. However, I write a lot and I keep the songs that are really speaking to me when I’m recording, and pitch everything else to other artists”, says Anderson. Keith Anderson also co-wrote the Grammy-nominated, “Beer Run (B Double E Double Are You In? )” for Garth Brooks and George Jones, “The Bed” for Gretchen Wilson and “Barn Burner” for Jason Michael Carroll. 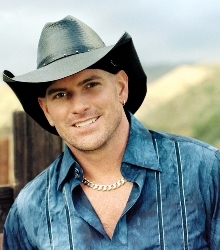 Keith Anderson’s sophomore CD garnered the biggest hit of his career, “I StillMiss You”, which peaked at #2 and another Top 25 hit, “Sunday Morning In America”. Taking the lead with other gold and platinum artists, Keith Anderson decided to take hold of the reigns this time by launching his music his own way and letting the fans help drive his music and passion. “I’ll Bring the Music” has had a huge resonance with the fans.” says Anderson. “As I tour all over the country, that is the song that gets them on their feet and is the song they are still singing as they head out the door. It reminds me of how “Pickin’ Wildflowers moved them”. And now Sirius XM Radio is “Dancin’ to the Beat” as it has been added to The Highway channel 59’s program, “On The Horizon”. Having helped hundreds of clients, we’re your best talent agency and agent for booking and hiring country music singer Keith Anderson, so call us at 888-655-4575 today and we’ll be happy to help you. We can help you book and hire any live country music bands and country singers in addition to those you see here on our site. We are not the exclusive agency of any live entertainers on this site, but we’re the best.